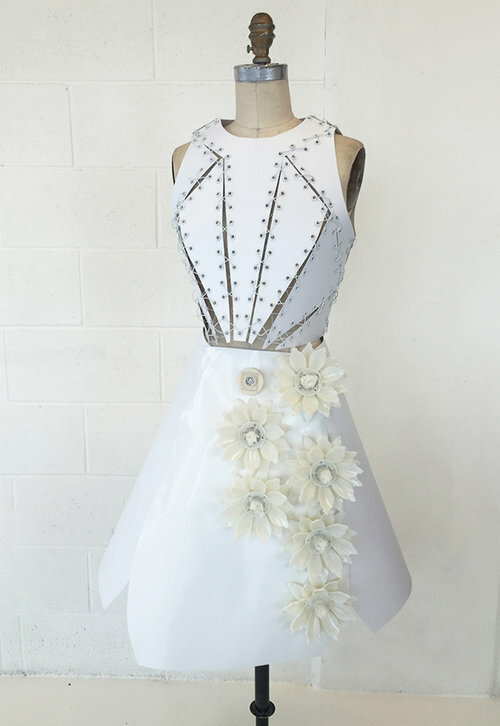 This Tech Dress Will Make You Popular With Scent #WearableWednesday #wearabletech #Arduino #3dprinting #fashion « Adafruit Industries – Makers, hackers, artists, designers and engineers! You may recall the name Birce Özkan, a designer that created a dress with falling leaves. Well, she continues her biomimicry flair with a fashion that emits scent—Fragrance Dress. The piece was designed for Unilever’s Creative Space, so sense of smell was definitely the focus. Birce concentrated on the science regarding flowers. The behavior of the dress is inspired by the plant’s pollination period; the clothing mimics the process through which flowers emit odors in order to attract pollinators. 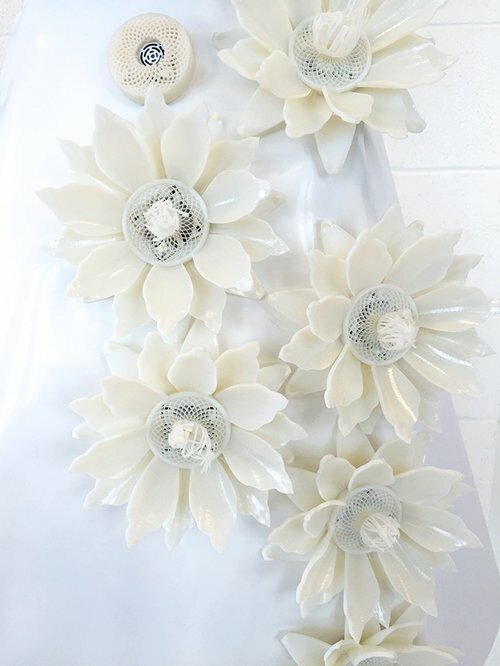 The flower theme extends from the petal styled skirt to the 3D printed blooms. Notice the petal-like mesh concealing the tiny fans in the flowers. When people approach the dress, a proximity sensor is triggered, causing an Arduino to power the fans, releasing scents. Of course fragrance can be used for different effects, which is what make this fun. Between 20-50 cm distance flowers 4, 5 & 6 start emitting Jasmine and Ylang-ylang which are aphrodisiac scents to increase attractiveness of the wearer. Between 5-19 cm distance flowers 1, 2 & 3 start emitting Sandalwood, Lavender, Chamomile, Rose which are soothing scents to provide a calm but intimate environment for both the wearer and the other people. Birce continues to design with nature in mind, creating pieces that are not only beautiful, but that allow mindful appreciation. Would you like some 3D printed flowers of your own? Check out our StarFlower Lights guide that will teach you how to turn an ordinary Neopixel light strand into flower power! This project uses a Circuit Playground Express microcontroller, so the flowers can change light patterns based on response to environmental conditions like light and sound. Take the plunge into biomimicry.